Good designers already know how to make products attractive (visceral design) and how to appeal to self- and brand-image (reflective design). Good behavioral designers know how to make products usable and understandable–indeed, that's the focus of most of this conference. It's time now to turn our attention to pleasure and fun. Here, the challenge for designers is behavioral design, where expectations drive emotions. This is where hope and fear, and satisfaction and anger reside. Deliver on positive expectations and people experience pleasure. Deliver something different than expected, but equally satisfying, and people have fun. Fail to deliver, or leave people feeling out of control, and you get a wide range of negative emotions. Expectation-driven design marks a new dimension for our discipline and provides a new framework for design. It shifts the emphasis from pure function to an emphasis on designs that both function well and offer people pleasure, enjoyment, a sense of accomplishment, and yes, even fun. Don Norman defines the framework in his book Emotional Design. 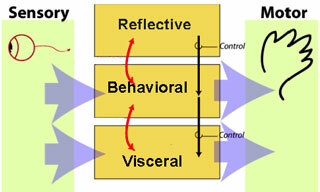 All human beings have three levels of processing in common: visceral, behavioral, and reflective. The visceral level is fast: it makes rapid judgments of what is good or bad, safe or dangerous, and sends appropriate signals to the muscles (the motor system) and alerts the rest of the brain. This is the start of affective processing. These are biologically determined and can be inhibited or enhanced through control signals from above. The behavioral level is the site of most human behavior. Its actions can be enhanced or inhibited by the reflective layer and, in turn, it can enhance or inhibit the visceral layer. The highest layer is that of reflective thought. Note that it does not have direct access either to sensory input or to the control of behavior. Instead it watches over, reflects upon, and tries to bias the behavioral level. This is a positive message. It is also an interruption that causes in itself anxiousness. Today people feel relief when they are done with a task. This is a negative feeling. Instead we want them to feel good. The correct number of items to offer is 3. Why that? 20 is too much. People reject to make a choice at all.